Grunert | Ocean Options, Inc. These holdover platesare a specially formulated mixture of water, salts, and inhibitors and provides stable box temperatures throughout the holdover period. The plates are hand polished #304 stainless steel for a clean aesthetic appearance, they have an easy mount flange system on the short side of the plate and come in four temperature ranges for different refrigeration and freezer applications. The Caribbean models of Grunert refrigeration are desinged for those yachts that utilize the power available from their main engine. Typically, all on board energy requirements are condensed into one or two engine run times per 24 hour period. These untis come standard with a PVC and stainless steel raw water condenser for improved efficiency and lower operating pressure(unlike other Grunert systems, air cooling is not an option.) 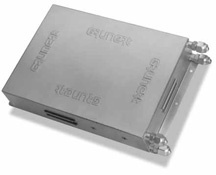 Add the Grunert Passagemaker to the Caribbean system for optimum flexibility for those times when you want to maintain box temperatures and the boat is unattended (or the vessel is hauled). The Mariner series of holdover refrigeration systems is available from 1/4 HP to 1HP capacities, for use with 12 or 24 volt DC power supplies, and has been proven to be the ideal system for seafaring vessels with or without on-board AC power. Its unique design allows for automatic operation when either the alternator or the battery charger is energized. An electrical interlock prevents accidental battery drain. These units come standard with a cupronickel seawater condenser for improved efficiency and lower operating condenser for improved efficiency and lower operating pressure. The Mariner series can efficiently cool a number of different box sizes and configurations. The condensing units can be installed in any convenient location and are practically unaffected by vibration or moisture. 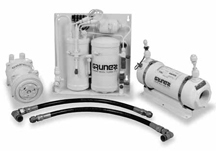 The Docksider model of Grunert refrigeration is designed for yachts with AC power sources on board. It is an ideal unit when used in conjunction with an engine-driven system or for a stand-alone application for smaller boxes. The Docksider features air and water-cooled condensers for maximum versatility. Air-cooled refrigeration offers standard efficiencies for use when a vessel is hauled. Water-cooled refrigerations provides increased efficiencies, and proper operation in high ambient temperatures. These units can cool a number of different box sizes and configurations, can be installed in any convenient location, and are unaffected by vibration or moisture. 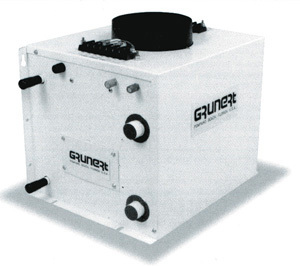 The Polar Mate from Grunert, provides 12 or 24 VDC, or 115 VAC marine refrigeration in a compact system. Components are specifically designed to fit in restricted areas aboard any vessel. Two models feature air or air/water cooled condensers for maximum versatility. Air cooled units are used when thru-hull fittings are not desired or when the vessel is hauled. Air/Water-cooled units also offer water cooling for increased efficiencies and redundant flexibility. Evaporator assemblies are available in both small and large capacities with custom configurations upon request. The Polar Mate is deal for small boxes or day sailing applications. The units can be installed in any convenient location and are practically unaffected by vibration or moisture. These models feature high quality components such as hermetically sealed compressors for quiet, efficient operation. Vibration isolators are incorporated in all mounting platforms for additional noise reduction. The remote electrical box is completely enclosed to protect all components and a 5' harness allows for a dry accessible mounting location.